My friend was telling me a story about a house he just visited that he used to stay at in the summertime when he was four years old. His memory of this house was that it was huge; the funny thing was, upon entering it as a grown adult, he realized that the house was anything but. This of course got me thinking about all the memories you have as a child that are just that, childhood memories that are colored by the fact that you are a child. My sisters and I used to go skiing and we used to marvel at how amazing my father and mother were at the sport. They went so fast and swished this way and that way with style and elegance, and looked a hell of a lot better than us kids stuck in the snow plow position. Funny thing was, when we became teenagers – and obviously were a bit more surly and keen on pointing out the obvious – we suddenly started watching Dad ski, I mean really watching. It was then that it dawned on us that perhaps, just maybe he wasn’t going to be challenging Bode Miller to any downhill slalom races. We realized the same thing about his French speaking skills when the waiters would stare back at him with confused looks on their faces, then glance at my mother for clarification. [As for my mother, she always remained looking graceful on skis, not sure how she escaped the childhood memory thing]. Obviously most childhood recollections can be attributed to the fact that as children we are small and the world is hence, bigger than us. So that lake you used to fish at was probably more like a pond, the ten ton army truck your dad used to drive was probably a two door Toyota flatbed and that house that looked like the grim reaper lived there, and was definitely haunted probably just needed a paint job…actually scratch that, I’m convinced kids have a darn good radar for the freaks of the world. So if we thought a house was haunted, it was. Then of course there are the fear based memories - sometimes irrational and other times make perfect sense, i.e. clowns. I used to be scared of the snowcats that would groom the mountains when it snowed. No, scared is an understatement. I thought these mechanical beasts brought up from the depths of hell actually breathed fire. I remember as a three year old – after my sister and I would inhale our favorite lunch of cottage cheese (must have the cherry on top) and chili from the ski lodge near where we lived at the time – we would then have to pass this steel jawed killer on the way home and I would damn near wet my pants from the sight of it. It just looked so huge and so menacing and the way it was inhaling the snow and then spitting it out again surely was a foreboding of what it was about to do to me. Of course, when I saw it a few years later, I breathed a sigh of relief when I realized that a man was actually driving it, and hence, it suddenly didn’t looks so Transformer-ish. Then there are those memories that just make you laugh from the sheer fact that you thought like a child. Like thinking the mole on my mom's face just below her mouth was a cookie, or a piece of cookie anyway (it certainly wasn't as big as a cookie). Clearly wishful thinking on my part as everything had some sort of connection to food for me back then. Or thinking that the tooth fairy lived in a Casino due to the fact that she dealt in silver dollars - Caesar's Palace to be exact, only the best for the tooth fairy. 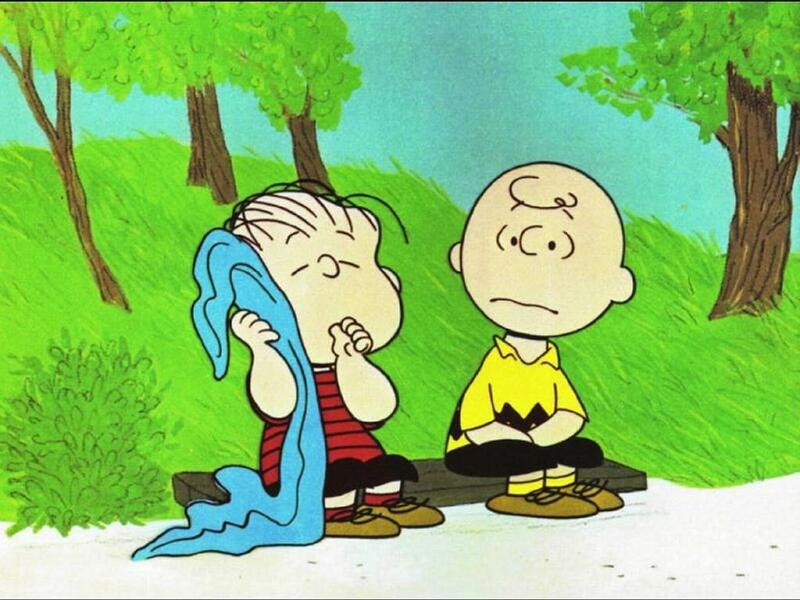 Then there was the all important question of whether I would ever understand the language the adults were speaking in Charlie Brown. Seriously, what were they babbling about? I look forward to the things that the King comes out with he's a bit older to share; as of now, he too sounds like the teacher in Charlie Brown. Then again, maybe he can tell me what the heck she was always talking about.